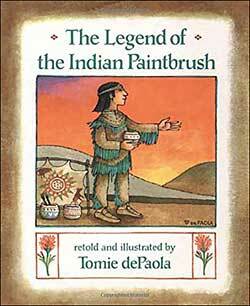 The Legend of the Indian Paintbrush retells an old Texas legend of how the beautiful Indian Paintbrush flower came into existence.In the story, a small Native American boy named Little Gopher worries because he is smaller than other boys and unable to run, shoot, and ride with them. But a wise shaman tells him not to worry; he has his own talents. 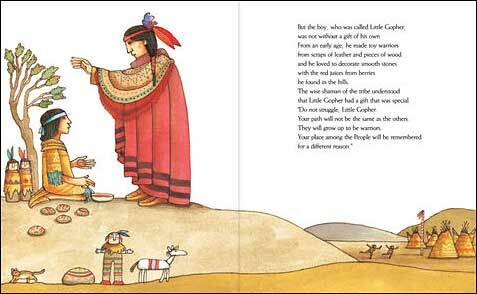 A few years later, when Little Gopher is on a hill thinking about becoming a man, he has a Dream-Vision in which an old man and a young maiden tell him that he is to record the events of his tribe so that people will remember them forever. They show him the tools he is to use and directs him to find them in preparation for the day that he would "paint a picture that is as pure as the colors in the evening sky." He immediately set about looking for and making the materials he needed, and then started to paint pictures of great hunts and great deeds, but he could never find the vibrant paint colors he needed to paint a beautiful, bright sunset. Finally one night, he heard a voice telling him that tomorrow would be the day he could paint the evening sky and that the paints would be provided for him. When he went to his special painting spot, he found brushes filled with paints sticking out of the ground (and in the illustration, looking quite a bit like flowers.) With those brushes, he painted a beautiful sunset painting. The next morning, the people awoke to find the countryside covered with color. The paint brushes had taken root and turned into yellow, red and orange flowers. The people rejoiced when the flowers arrived each spring, and Little Gopher was thenceforth called He-Who-Brought-the-Sunset-to-the-Earth. 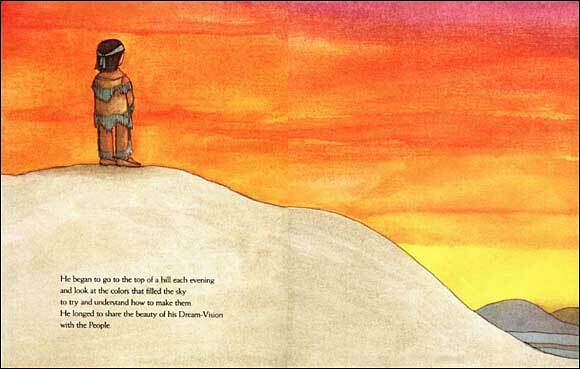 Below are sample spreads from inside The Legend of the Indian Paintbrush. We love Tomie dePaola's trademark illustrations. If you like this book, be sure to check out his other 'legend' books. 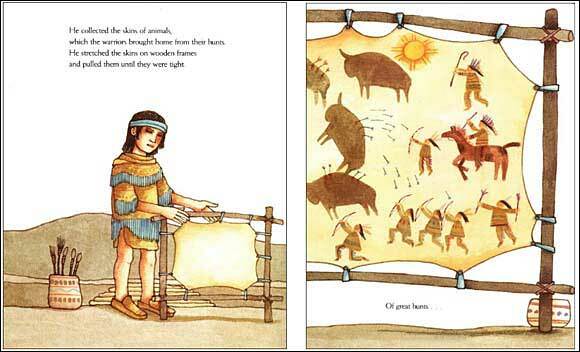 The obvious Native-American-themed activity to accompany this book would be to do an art project involving creating pictographs and Native American style art. 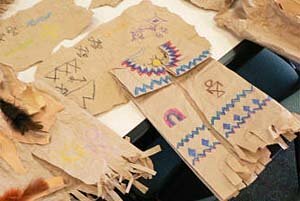 In the book, DePaola incorporates Native American pictographs and illustration style into his trademark personal style.